Cultural resource visit Whitestone Hill. The present-day state of North Dakota was once tribal land and now encompasses numerous tribal traditional cultural properties and sacred sites in addition to reservations. The movement of settlers from the east during the 1800s resulted in displacement of original inhabitants. As a consequence, tribes located not only in present-day North Dakota but also in South Dakota, Minnesota, Montana, and Nebraska retain strong ancestral, cultural, and spiritual ties to the area. In 1992, Congress amended the National Historic Preservation Act (NHPA) to provide Indian tribes and Native Hawaiian organizations a formal role in the national historic preservation program including a requirement that federal agencies consult them in the Section 106 process, to ensure their voices were heard. Implementing this requirement has often proven to be a challenge, but the North Dakota Department of Transportation (NDDOT) and the Federal Highway Administration (FHWA) reached out to the tribal community to develop an outstanding collaborative process. 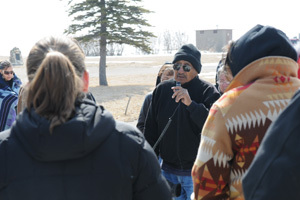 In compliance with the requirements of the 1992 NHPA amendments, NDDOT was consulting individually with as many as eight Indian tribes on projects in the late 1990s. The agency accordingly sought to build tribal partnerships and improve procedures. For the U.S. Highway 2 project in 2000-2001, tribal elders and NDDOT archaeologists worked together in the field to identify and avoid sensitive sites. Tribes and government officials gained experience at working cooperatively as a unit and saw an opportunity to use this model to address tribal concerns in future highway projects. In 2008, NDDOT started using tribal monitors in the field with archaeologists. The subsequent NW Williston Bypass project greatly expanded on the concept of collaborative effort and had a team of 15 tribal members identifying stone features, delineating site boundaries, plotting GPS points, preparing feature drawings, and the like. FHWA is the federal agency responsible for conducting the Section 106 process for North Dakota highway projects, in close coordination with NDDOT. Section 106 requires that federal agencies assess the effects of the projects they carry out, fund, or permit on historic properties. Federal agencies are required to consult with parties that have interests in the historic property when adverse effects are likely. In 2004, the Standing Rock Sioux Tribe Tribal Historic Preservation Officer (THPO) suggested working with other THPOs as a group. Representatives of other tribes agreed, and through a series of meetings in 2004-2006 created the Tribal Consultation Committee (TCC) process. The tribes drafted a Programmatic Agreement (PA) formalizing the TCC in 2006; NDDOT and FHWA agreed to it in 2008. The PA provided efficiencies and opportunities for early tribal engagement by bringing potential issues to the TCC in advance of the planning and development process for transportation projects and thereby avoiding problems before they are created. A vitally important component was that the agencies directly involved tribes in the creation of the PA from the outset, through intensive meetings where the agencies and tribes jointly worked on and finalized the plan. A key feature was creation of the TCC, which would meet formally twice a year to consider issues affecting tribal heritage. The PA was updated in 2014, and the initial TCC comprised of eight tribes has expanded to 19 participating tribes. Often agencies fail to involve Indian tribes early enough in project planning and lack sufficient understanding of traditional cultural properties, sacred sites, and tribal cultural and spiritual practices to properly address tribal issues in Section 106 consultations. NDDOT and FHWA recognized this and proactively sought solutions not only to current issues, but to create efficiencies for future projects through regular contact and information sharing. In doing so, the agencies and the tribes created an exemplary model of how to work together to strengthen relationships and coordination where varying cultures and perspectives come together. With North Dakota undergoing an energy development boom of virtually unprecedented dimensions, this has not eliminated tensions between sometimes very different worldviews but did put in place agreements and means to honestly, fully, and efficiently resolve issues where tribal heritage is threatened by transportation project planning and development.